An experienced Architect with a background in terminal planning and architecture, Mevin is passionate about aviation, especially planning and designing airports. His role as Airport Planner involves technical capacity planning and assessing process models and solutions. He also manages data collection and compilation to update databases and supports the team with client consultancy. 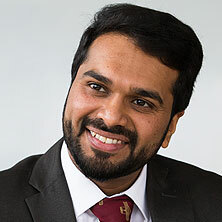 Mevin has an MSc in Airport Planning and Management from Cranfield University, covering areas such as Airport Operations, Airport Strategic Planning and Airport Design. His thesis focused on baggage process flow, and optimizing the level of automation in baggage handling. With a bachelor degree in Architecture from the National Institute of Technology Calicut, India, and experience as an airport architect at KITCO Limited, one of India’s premier Engineering, Management & Project consultancy firms, Mevin is able to think from both a design and operational perspective bringing life and insight to aviation projects.